Home Our Air Duct Services Air Duct Cleaning 3 Reasons to Get Your Air Ducts Cleaned this Spring! Knowledge about air duct cleaning is relatively new, meaning a lack of understanding is common among most. Because awareness surrounding this topic is in its early stages, there are blanket recommendations to follow in order to determine whether your air ducts need cleaning. The U.S Environmental Protection Agency (EPA) has warned users about the dangers of dirty air ducts, and though there are no conclusive studies to demonstrate a direct link with health problems, the importance of breathing in clean air is paramount to your very existence. Pollutants can enter the home from indoors and outdoors, from activities like cleaning, smoking, cooking, or moving around. Exposure to contaminants in air ducts is ill-advised, but when should you consider getting your air ducts cleaned? Read on to find out. Is That Mold In My Air Duct?! 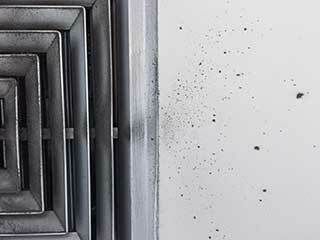 Visible mold on any component of your heating and cooling system should ring alarm bells. When looking for mold, it’s important to consider aspects which aren’t visible at first glance. An expert can effectively assess the status of your ducts, both externally and internally, while determining if mold is present. If the insulation in your air ducts gets wet or moldy, it should be replaced entirely. What’s most important is that you address the underlying cause of mold, to prevent it from coming back. I Think I Just Saw a Rat In My Air Duct! If you discover any creatures in your air ducts, whether vermin or creepy crawlers, this suggests it’s time to get your air ducts cleaned. I mean let’s face it, the last thing you want is your privacy invaded! Ultimately though, leaving issues like this untreated could result in infestations, so it’s best to attend to the issue sooner than later! Wow...Is It Me or is My Duct Really Dusty? When clogged with excessive volumes of dust and debris, it’s probably time to get your air ducts cleaned. The last thing you want is for dust and debris to enter your breathing space, which can easily happen when particles are released from your supply registers. We hope you have found this information useful, and are well-informed on situations which require you to take action and get your air ducts cleaned. Thanks for reading, and if you would like to ask our experts anything, please contact us.